Hi sweet friends! Can you believe it’s December already?! Twenty-two more days and Christmas will be here – wowzee! 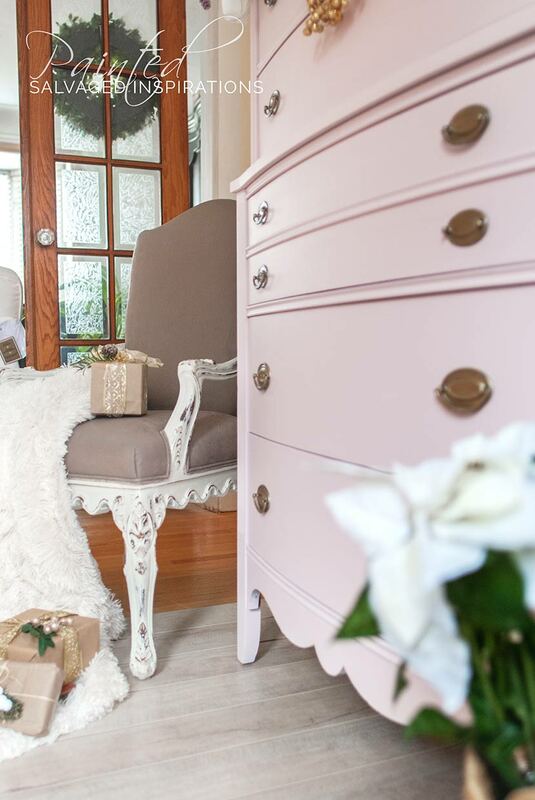 Today I’m sharing a Christmas Styled Pink Champagne Painted Dresser… a makeover that almost never happened. When I first saw this mahogany tallboy I kept walking. The work required to patch up all the gouges and scars wasn’t doing it for me. I must have been having a lazy day. Have you ever found something in a thrift store, passed on it for whatever reason, but then couldn’t get it off your mind? That’s a sure sign to detour back and buy it because it’s meant to be yours, right? I circled back and picked up this dresser for $40. As I said, I must have been having a lazy-brain-day because I don’t know how I missed seeing all this potential the first time around! After some wood fill, prime and spraying a few coats of Pink Champagne here’s the after. What do you think? Are you loving this pink? I started by giving this dresser a thorough cleaning with TSP, rinsing and then letting it dry. 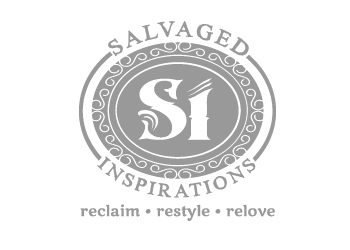 Then I filled all the holes and scratches with this wood filler and then gave this entire dresser a sanding with this sander – which if you do a lot of furniture makeovers – treat yourself because it’s a must-have! 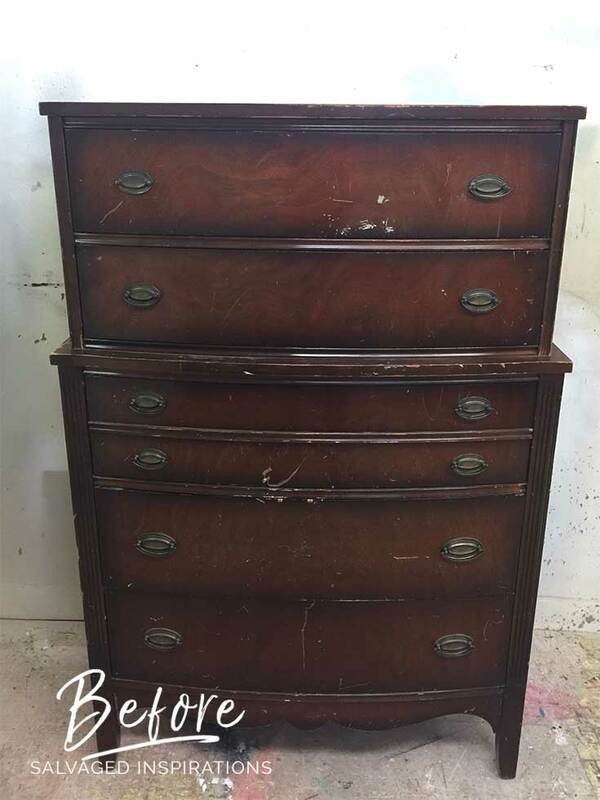 This tallboy dresser is mahogany so bleed through was guaranteed. I applied two coats of BIN Shellac Primer to cover the bleedthrough stains and then spot applied it on a few areas that were still showing through. The best part about BIN is it takes out the guesswork. Once you don’t SEE anymore staining coming through this primer, it won’t come through on your paint or topcoat. With other stain blockers, often there’s a little guesswork as to how many coats to apply because there’s no actual visual – like with clear shellac for instance. Once it was primed, lightly sanded, and the dust removed with a tack cloth, I had a whole lot of fun spraying this piece with two coats of DB’s Pink Champagne. I start missing my sprayer if I don’t bust it out every once in a while. 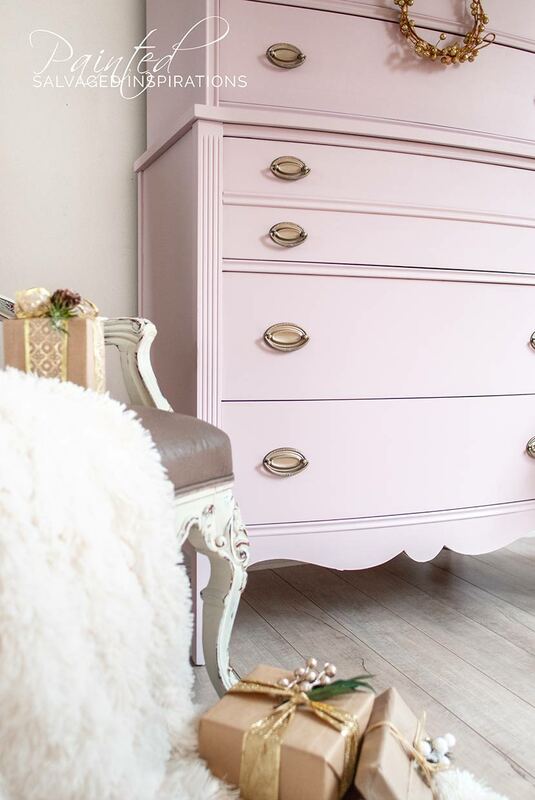 If you’ve never tried ‘shooting’ furniture, it’s a fun painting technique that gives a gorgeous flawless finish. Spraying with chalk/mineral paint works really well too. I typically thin my chalky paints by adding about 10-15% water to the paint when spraying my furniture. After spraying two coats, I gave my piece a light sanding and then top-coated with Dixie Belle’s Clear Wax. As the finishing touch, I updated the original hardware with a soft Gold spray paint. 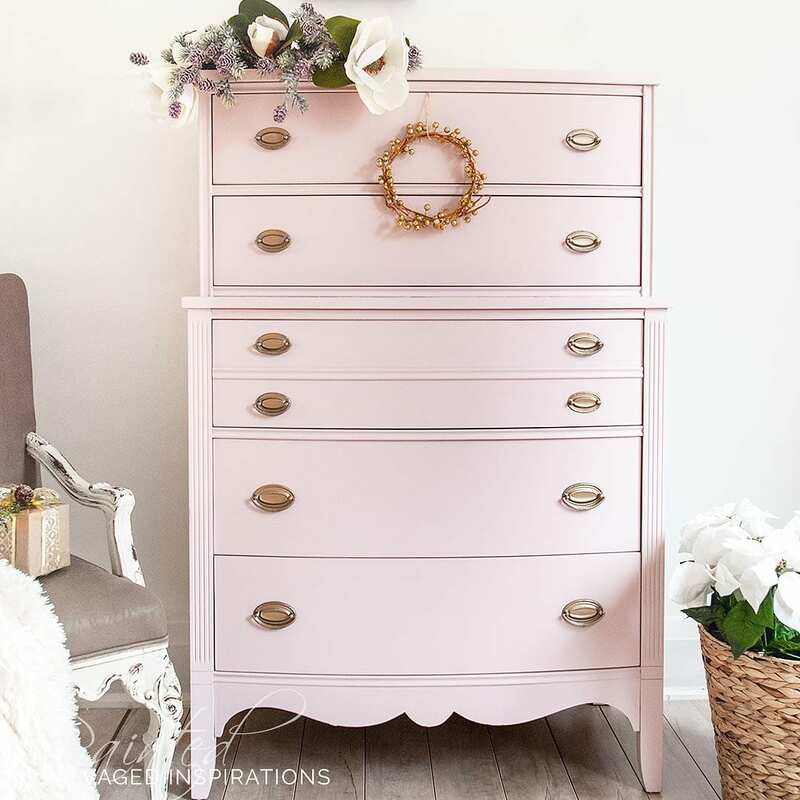 How To Paint Furniture WITHOUT Brushmarks! Previous Post: « How To Paint Buffalo Plaid in 5 Easy Steps… Christmas Style! This is gorgeous!! I’ll definitely be following you. I have so many items to paint, but just don’t have time since I wok full time. But will be retiring next year , can’t wait. And great work and thanks for sharing your steps. Hi Rida! A 16oz jar should be plenty but everyone has a different style of painting. If you’re worried it won’t be enough, it’s always better to buy a little more and have leftovers than to run out before you finish a project. Beautiful color and finished piece! Any tips on applying wood putty to curved and sharp edges? Help, please. Woah this is gorgeous! That pink is the perfect shade! Love what you did with this piece. Such a pretty and dainty piece! I totally love it. Denise, this piece is just lovely. 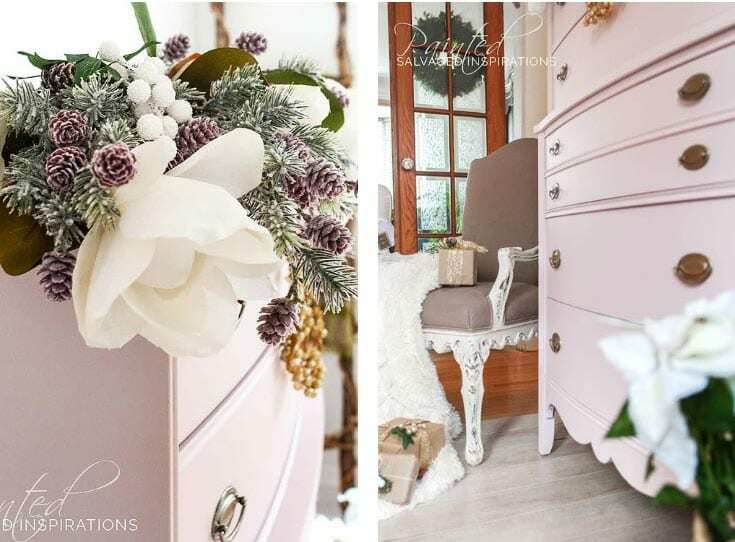 So nice to see a different finish, I am super impressed with the Huskey paint gun finish…….I’m thinkin’ that Dixie Belle needs to add this piece to their Pink champagne display line-up…..it will double-up sales after customers take one look! So sweet,so elegant. Staging is perfect. Woohoo for the IG, thanks, Roseann! 🙂 … and feel free to email me. The floral on the dresser is a mish-mash I created. 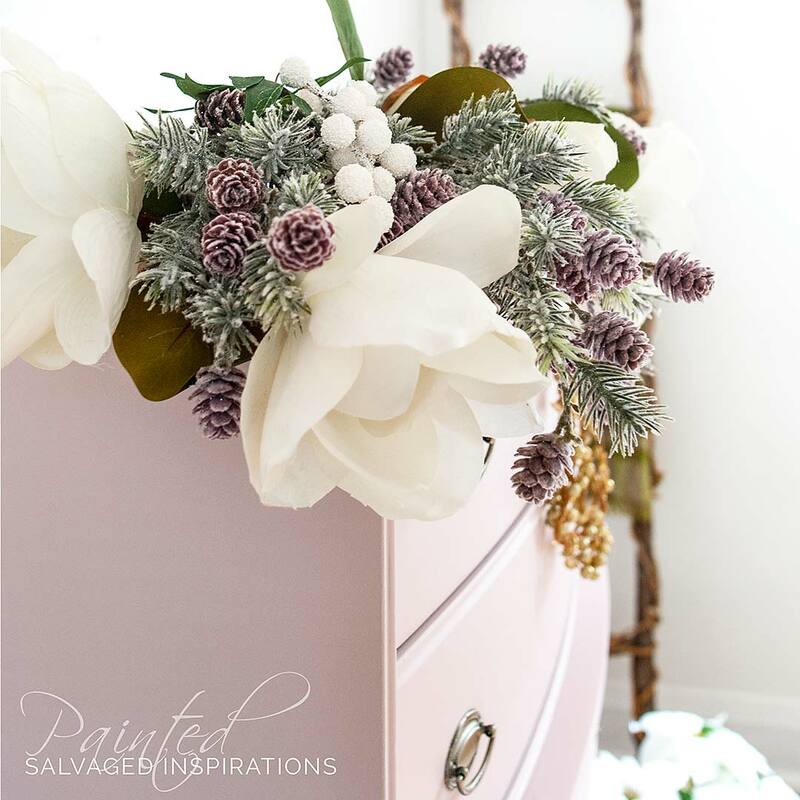 I took some Christmas greenery with little pine cones and added in my magnolia flowers from the Magnolia Homes Collection. That’s a very pretty pink and so nicely staged. Amazingly beautiful! I was given a dresser just like this unfortunately it had to go into storage. Even if I had kicked out the grandkids I still wouldn’t have had enough room in the car to bring it to North Dakota from California. Thanks Lorin, and bummer about the piece but I get it. It’s a large tallboy and weighs a TON! Not easy to transport anywhere never mind North Dakota to CA!!! I have never been a fan of the color pink, until today. Stunning, perfect ‘wow I want to have that ‘ redo! Thank you. Again , you did not disappoint. This is a huge compliment Dee, thank you! Hugs. 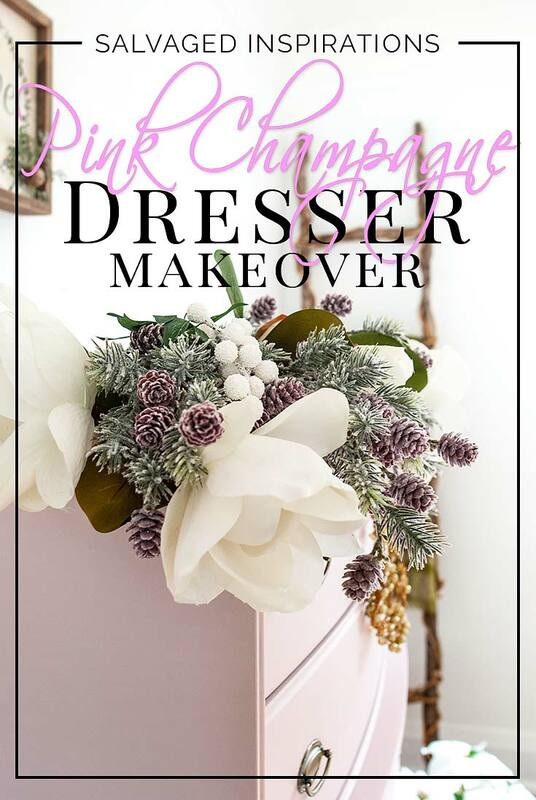 This is a beautiful makeover and I adore the pink you used! Do you find it quicker to spray paint your furniture? Hi John and WELCOME! Great question. What I do with the inside of the drawers always depends on the condition of the drawers. In this case, the drawers got a really good cleaning and they look amazing. When the drawers are not looking great, I either sand the insides or paint them… and sometimes it requires both. 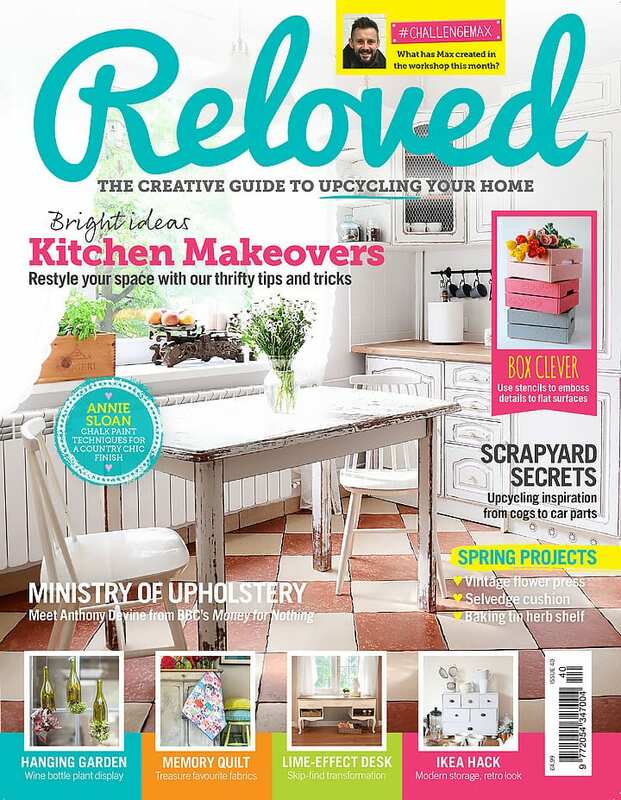 What a perfect pink, and what a perfectly professional revamp you’ve achieved on that piece. I love it. I really admire your patience. Do you suppose that one could achieve a nice finish using a brush, and if so, would it be best to use a sponge brush, or bristle? I just checked the DB website for retailers in our area (within 50 km of Vancouver) and they say there are none. 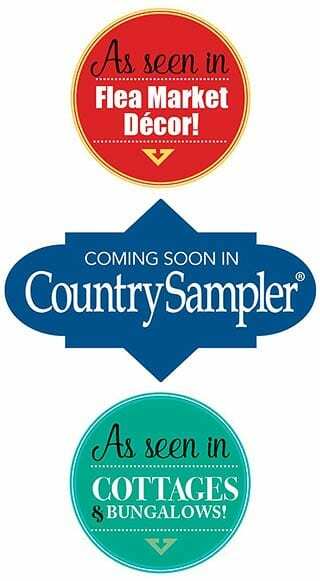 Are you a DB retailer ? Happy Monday Denise. 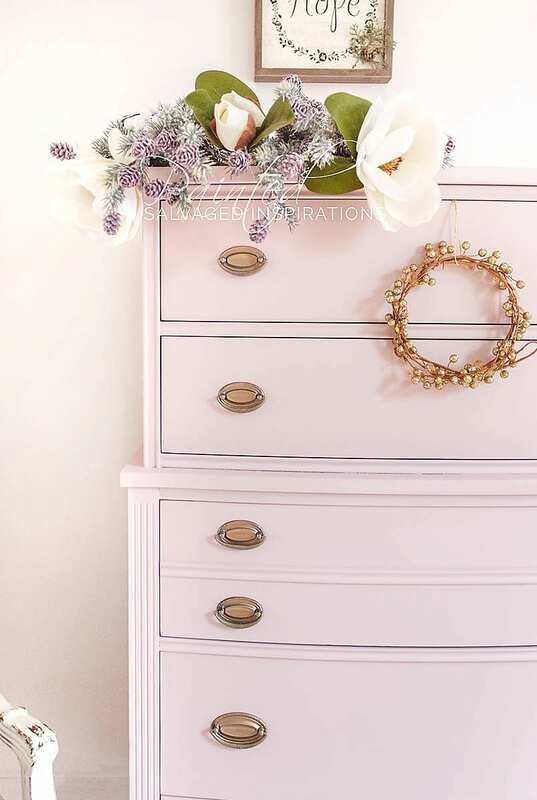 I’m infatuated with the soft pink you used on this dresser. What a beautiful color. 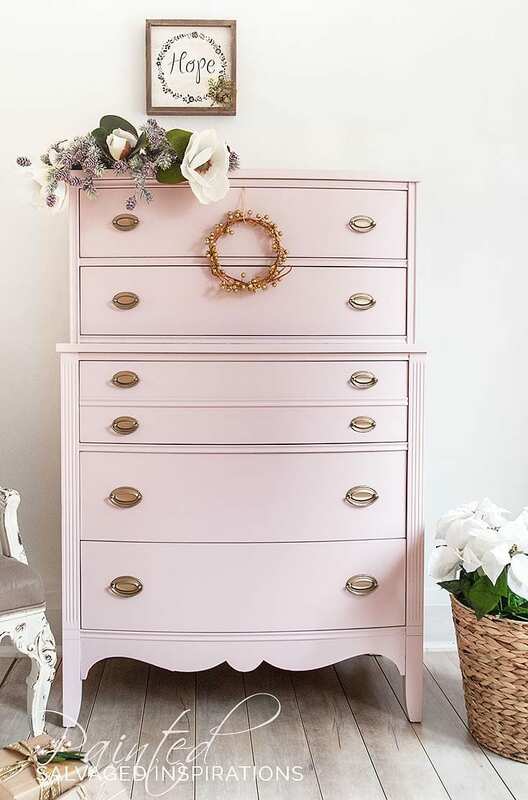 I can just imagine it in a little girl’s room or MY dressing room;) I always enjoy seeing how you take an old, scratched, worn-out piece of furniture and turn it into a treasure. Gorgeous (as always)!!!! 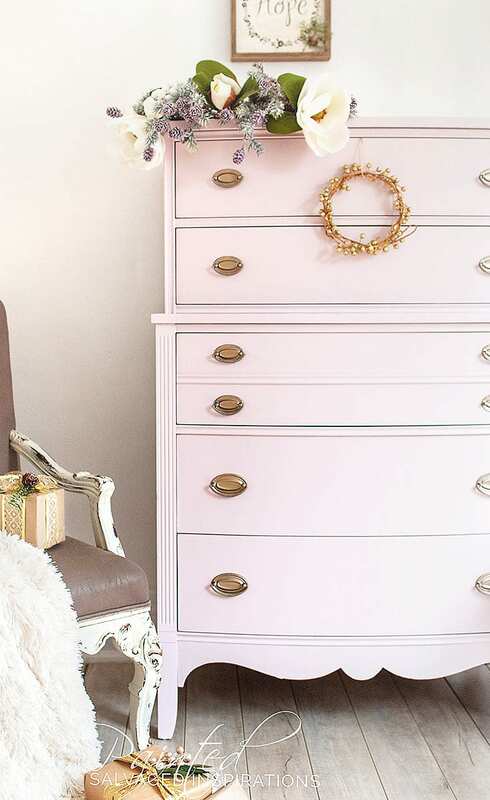 I love, love, love this dresser! it is GORGEOUS! I love this color, Beautiful work! I’ve been looking for a pink color that does not look like pepto-bismal. Does this paint look as nice when brushed painted or does it need to be sprayed to look this pretty? BREATHTAKING! I love that pink it is just gorgeous! You did a beautiful job on that! 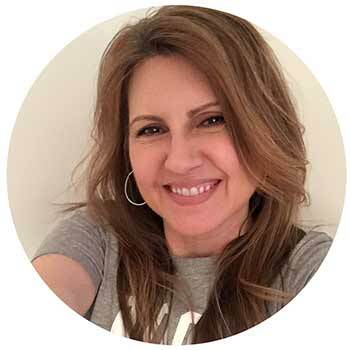 Denise…just wanted to let you know I showed this to my 13 almost 14 year old granddaughter and she was in love. Now she wants me to paint her one just like it! I keep coming back as I just fell in love with the color too and can’t seem to get enough..lol! The paint color is as pretty as the name! Good thing you went back because the results are stunning, Denise. So pretty! I love the combo of the pink with the gold hardware. And I know exactly what you mean about feeling lazy and passing on something at the thrift store only to go back for it later. I did that recently with a desk. Of course, I still haven’t gotten around to painting mine yet, but I’ll get there … maybe after the holidays! Thanks Linda! 🙂 And I know that desk you almost passed up on is going to be fabulous – can’t wait to see!